Nearly 20% of Americans suffer from allergy symptoms, often caused by environmental triggers, called allergens. Does your family have allergy problems? Asthma sufferers? Ashly Rugs can help alleviate your symptoms and your attacks. 17 million Americans are diagnosed with asthma, and the numbers are increasing rapidly. Contact Ashly Rugs today, and breath freely. We will help you make your home or office a safe, healthy, clean place to live. Specializing in Oriental Rug Cleaning We specialize in Fine Handmade Oriental rug such as: Persian, Turkish Rugs, Pakistan Rugs, Afghan Rugs, Chinese Rugs, Indian Rugs, Portuguese Rugs, Egyptian Rugs, Romanian Rugs, Silk Rugs, and Antique Rugs. Among our customers are rug dealers, rug Importers and Carpet Cleaners from all over the US. We have proven our expertise since 1979. Dusting is the second stage in our process.70% of cleaning a rug involves removing dust. As a result, the pile of the rug becomes open and fresh. We wash the rugs on both sides with special shampoos, which we provide. After that, we rinse the rug to remove all the detergent residues off the rug. Soaking is one of the most important processes a rug can undergo. By soaking the rug, we can remove dirt, Pet stains, and liquid stains. We soak the rug and with this process we are able to remove all the odor from the rug. We then wash the rug and it becomes 100% clean. Carpet care is crucial to keeping your rugs and carpets in excellent condition. If you think it’s time for your carpets to get deep cleaned, here are a few reasons why you’ll want to go for Rug Cleaning services in Katy, Houston, Memorial, Woodlands, Sugar Land, River Oaks, Fulshear and other areas TX. That's where we come in. 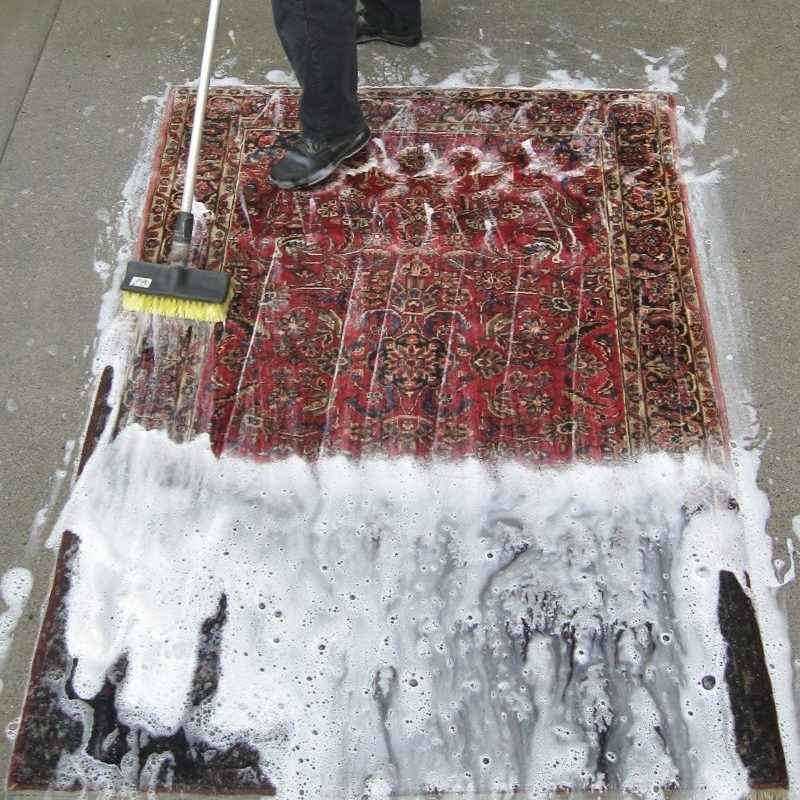 At Ashly Fine Rugs, we can provide you with cleaning services for easy and stress-free rug care and maintenance. Your rugs are about 4,000 times dirtier than a toilet seat. With about 200,000 bacteria in every square inch and fiber of your rugs, that’s not information you can easily dismiss. If you and your family often have allergies, it may be due to your carpets. By looking for Rug Cleaning services in Houston, TX and hiring a team of pros at Ashly Fine Rugs to deep-clean your rugs, you can keep those allergens at bay. If you have pets, that’s going to increase the risks of allergens in your home. Best to have your carpets and rugs cleaned much more regularly. Have kids? Then it’s even more important to take steps and hire Carpet Cleaning experts to help you provide your kids with a home environment that’s free of any allergens. Otherwise, this could easily lead to health conditions like asthma and more. We offer Rug Cleaning assistance for customers in Katy , Houston and Memorial, Woodlands, Sugar Land, River Oaks, Fulshear and other areas TX. Rather than dry cleaning or spot cleaning, send your rugs in for deep soak washing. That’s what we do at Ashly Rugs. If you can’t remember the last time you had your rugs cleaned—or if you have never had them cleaned in the first place—then there’s no time like the present. Have questions? No problem. Call us up today, and we can provide you with all the information you need to decide. With a team of expert cleaners who take care to clean, repair, and restore rugs, you can easily have your rugs cleaned and restored. The sooner you go for Rug Wash services, the sooner you can clear those allergens in your home. If you’re bringing a loved one home from the hospital, having dirty carpets and rugs around could compromise their recovery process. If you need professional, high-quality Oriental Rug Cleaning services in TX, you won’t have to look any further to get the help you need. Contact us at Ashly Fine Rugs and let us know how we can help you turn your home allergen-free with our carpet care and cleaning services.